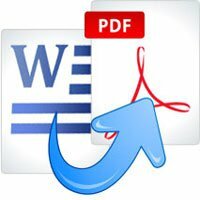 Open a file in an Office application you want to convert in pdf. Click on file button and choose option "save as"
Now a new window will open. Next change extension in "save as type" field and name the file in "file name" field. Click save and save it in a desired location. How to Uninstall ‘Get forms online’ Malware? How to uninstall idm from windows 10? How to get and save user input during installation using Advanced Installer? How to gain space on your Android device?